Technical articles, writeups and discussion! We’re constantly clicking on all sorts of different URL’s throughout the day. These clickable links appear in webpages (including in “web apps” like gmail) in mail clients like Evolution, in terminals such as GNOME-terminal, and any other GTK+ app on your GNU/Linux desktop. I wanted to perform custom actions when arbitrary URL’s are clicked, including running certain links in separate Firefox profiles. There are a bunch of different steps you have to do to get this working, but it should be easy to follow along. I’m doing all of this on Fedora 23, but it should work on other GNU/Linux environments. You should get two separate sessions, where the commands with -P ghttps should be in your new “ghttps” session (or whatever you named it). Internet searches seem to report that some users can’t run two sessions at the same time without including the --no-remote option, but I didn’t seem to need it. YMMV. Make sure the file is executable with chmod u+x ~/bin/firefox and in your $PATH. 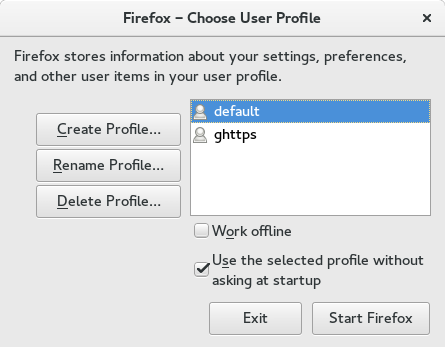 Now whenever you run the firefox program, it will automatically run firefox with a profile that corresponds to the pattern of URL that you matched. Feel free to improve this script with a more comprehensive pattern to profile correspondence mechanism. What the GNOME Settings->Details->Default Applications dialog looks like after I made the change. 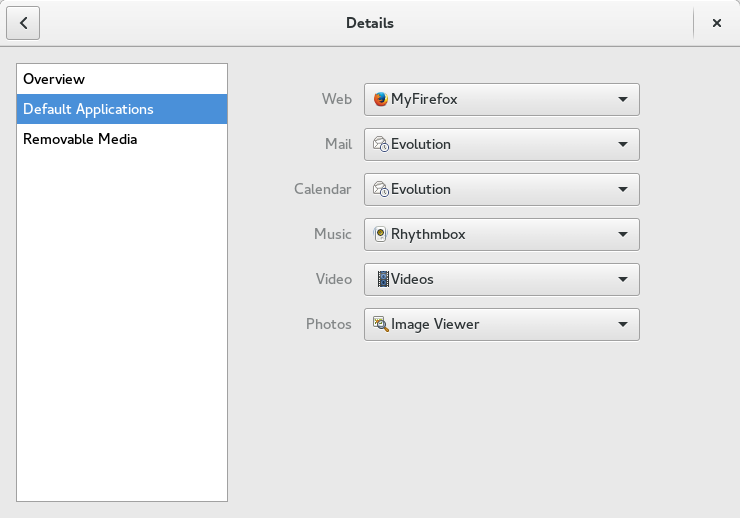 I had to change the “Web” handler to be a “MyFirefox” instead of the previous default of “Firefox”. Those applications are listed in .desktop files which exist on your system. The system wide firefox desktop file is located at: /usr/share/applications/firefox.desktop and although the path to the executable in this file does not set a directory prefix, it unfortunately does not seem to obey my shell $PATH which includes ~/bin/. If you know how to set this so .desktop files include ~/bin/ in their search, then I’d really appreciate it if you left me a comment! To work around the $PATH issue, I copied the above file into ~/.local/share/applications/firefox.desktop and edited it so that the three Exec= commands include a path prefix of /home/james/bin/. I also renamed the Name= entry so that it was visually obvious that a different .desktop file was in use. This will replace the firefox launcher throughout your desktop and as well in the “Default Applications” menu. Changing the name is optional, but it might be instructional for you. It’s important that you not rename the file, because only files which are listed in one of the GNOME mime list files will show up in the “Default Applications” chooser. Once you’ve created the file, you can check in these settings to ensure it’s set as the default. 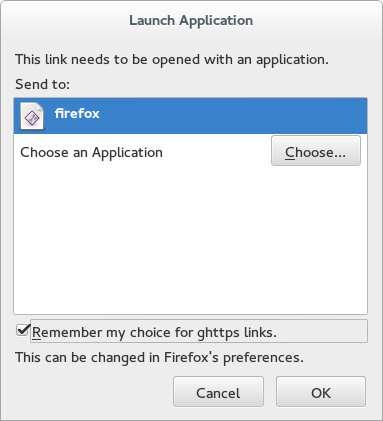 I forget if you need to close firefox, and logout and then back in to your GNOME session for this to work, so if things aren’t working perfectly by now, ensure you’ve done that once. You can test this by clicking on a link in your terminal and checking to see that it opens the correct firefox. Everything should now be working perfectly, until you click on a link within firefox which doesn’t redirect to your shell firefox wrapper. We want this to be seamless, so we’ll have to hack into the firefox API for that. Thankfully there’s a plugin which already does this for us, so we can use it and avoid getting our hands too dirty! It’s called “Redirector“. Install it. A screenshot from the firefox Redirector plugin. You can conveniently import and export your redirects from the plugin, and so I’ve included the corresponding .json equivalent for your convenience. Does everything look correct? Take a second to have a closer look. You might think that I made a typo in the “Redirect to:” field”. There’s no such protocol as ghttps you say? That’s good news, because its use was intentional. Running an external command in response to certain links is what allows them to open external programs such as mail clients, PDF viewers, and image viewers. While some of these functions have been pulled into the browser, the need is still there and this is what we’ll use to trigger our firefox shell script. It’s actually important that we make an external system call because otherwise there would no way for a link in the default browser profile to open in browser profile number two. Running any such command is only possible with a custom or unique protocol. You might be used to seeing https:// for URL’s, but since these are captured by the browser as native links, we need something different. This is what the ghttps:// that we mentioned above is for. Please note that the leading values (in brackets) are the types that you’ll need to use. Omit the semicolons, those separate the key and the corresponding value you should give it. You’ll naturally want to use the correct path to your firefox script. You should only need to deal with this dialog once! At this point you may need to restart firefox. Your new protocol handler is now installed! Enjoy automatically handling special URL’s. There is one small usability bug which you might experience. If the link that should pattern match out to the protocol exists with a target=_blank (open in new window attribute) then once you’ve activated the link, there will be a leftover blank firefox window to close. This is a known issue in firefox which occurs with other handlers as well. If anyone can work on this issue and/or find me a link to the ticket number, I’d appreciate it. where example.com is the domain your organization uses. By setting the above string as the bash firefox $prefix variable, and with a similar pattern in the redirector plugin, you can ensure that you’ll always get documents opening up in browser sessions connected to the correct google account! This is useful if you have multiple google accounts which you wish to automatically segregate to avoid having to constantly switch between them! It would be great to consolidate the patterns as expressed in the Redirector database and the firefox bash script. It would probably make sense to generate a json file that both tools can use. Additional work to extend my bash script would be necessary. Patches welcome! It would be convenient if there was an easy setup script to automate through the myriad of steps that I took you through to get this all working. If someone can provide a simple bash equivalent, I would love to have it. I hope you enjoyed this article and this set of techniques! Hopefully you can appreciate how stringing five different techniques together can produce something useful. A big thank you goes out to SlashLife from the #firefox IRC channel. 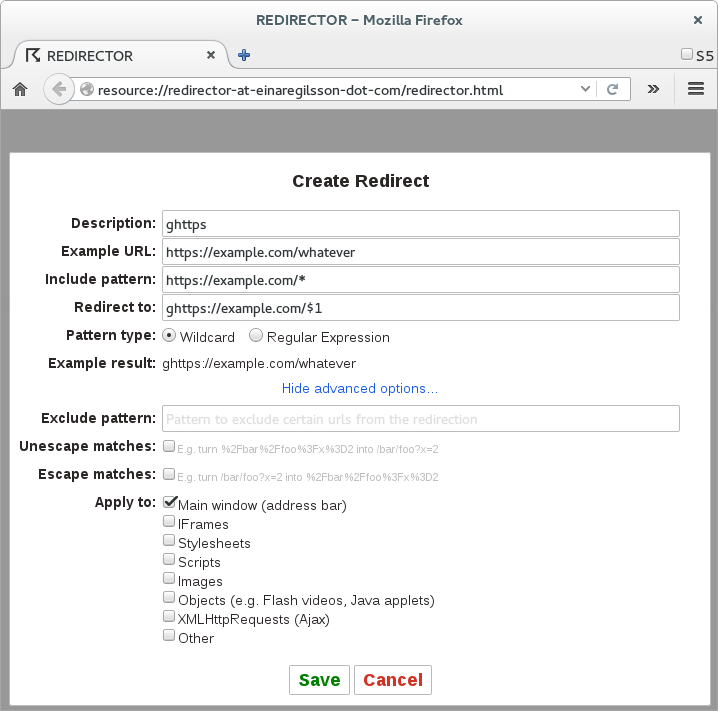 This user pointed me to the Redirector plugin which was critical for intercepting arbitrary URL’s in firefox. PS: I’d like to apologize for not posting anything in the last three months! I’ve been busy hacking on something big, which I’ll hope to announce soon. Stay tuned and thanks for reading this far!